Ghost Hunting Theories: Mysterious Cave Vibrations Before Spelunker Goes Missing! Mysterious Cave Vibrations Before Spelunker Goes Missing! 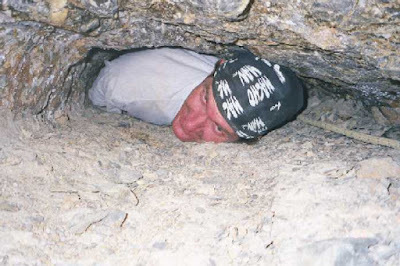 Sadly, this enthusiastic caver (video above) went missing while exploring a cave in Nevada. Before his disappearance, Kenny Veach commented on a YouTube video claiming to have found a cave around Nellis Air Force Base in southern Nevada. He was curious about the cave's abnormal shape.When he investigated further, something frightening began happening to his body. He reported that he had gotten near the cave and felt a strange vibration and as he tried to enter, his whole body vibrated. He got scared and ran. He went to go back and find the cave (video above). A month later, on an excursion to find it, he went missing. Searchers eventually found his cell phone outside of an old mine shaft, but no signs of him. There a great deal of stories of things inside of caves, everything from ancient giants still residing within the Death Valley mountains to Reptoids in Missouri and secret bases. This story above not the only caver to feel compelled to go back to a creepy cave, only to go missing. There was another in Utah that became an Internet legend to the point that folks aren't sure if this is true. This is the legend of "Ted the Caver." Dating back to 2001, Ted the Caver may be the first creepypasta the Internet has ever produced. It is certainly one of the longest and most exhaustively photographically detailed. Ted and his friend “B” (all names of persons and locations are said to be withheld) decide to explore a deliberately unidentified cave. They dig their way into a narrow opening, which they believe to be about 18 centimeters (7 in) tall—barely tall enough to crawl through. When they begin crawling into this narrow confine, they find hieroglyphics, hear strange noises, and feel the presence of something seemingly malignant. Much of this happens while they’re about as trapped and helpless as they can possibly be. The author writes and posts this account of what happened but then insists he feels compelled to return to the cave. That’s the last we hear from him. Here's some unusual sounds (above video) coming from a cave. (Above video) 110 Hz is felt by some researchers who study archaeo-acoustics, to be a frequency used for chanting and sought after in caves and ancient stone megaliths to create a resonance of a spiritually activating nature. Depending on caves, different harmonics can be achieved due to its depth and can cause a standing wave. Cave singing might have been a goal for ancient man, as the same acoustic application is incorporated in cathedrals. Source: Recent acoustic experiments carried out in some of the caves in southwestern France under the direction of Iégor Reznikoff have shown that in the majority of such caves, the presence of wall paintings and drawings is highly correlated with the phenomenon of natural echo at that location in the cave, and especially so at particular resonant frequencies. Furthermore, it has been established that indications relating to the nature of the particularly resonant sound are recorded not in the form of some kind of random graffiti, dispersed at the whim of the prehistoric artist, but instead as precisely-coded signs within the pictorial representation, often explicitly indicated by means of lines or dots emerging from the mouth of a person or animal drawn, in precisely those areas of the cave where the echo is most pronounced! There have long been legends of reptoids, wildmen, ghosts, ancient giants, and even skinwalkers inside of caves. Some believe caves lead to Hollow Earth and others believe that aliens use them. Caves have housed some of the most amazing discoveries of all times, like the Denisova Cave in Siberia where they found that Neanderthal, Homo sapiens and another not previously known man, Denisovans, lived in the same cave. Art work and tools of ancient times have been found in caves. The red-haired giants were reportedly burned inside a cave. Mummies are often discovered in caves where there are ideal conditions to keep them. Gold, silver, and other precious metals and gems comes from caves making mining a highly lucrative practice around the world. The figures on people who actually die in caves is very low and even includes things like having a heart attack or getting lost and most involve risky behaviors like cave diving. Is it possible that caves house civilizations we don't know about? Certainly they could. 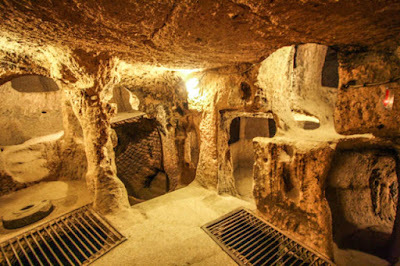 After all, there was an amazing circuit of dug tunnels found from Turkey to an underground city from 5000 years ago.